If you want to get a sense of Israel in one afternoon, stop at the Jaffa Flea Market: Shuk Ha’Pishpeshim. Jaffa throbs with the heart beat of Israel a mixture of old crumbling buildings and contemporary architecture, sharp, stylish boutiques along with crowded and dusty thrift stores, hoity galleries and schticky shops, fancy, white linen restaurants and falafel stands, synagogues and mosques – need I go on?? 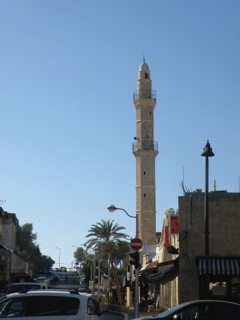 Just drive down the Tel Aviv beach promenade, heading south and follow the road to and around the clock tower (See above). Park (good luck!) and walk over to the east where the market awaits. We had to make a stop for Laura’s daily dose of fresh pomegranate juice – seriously, who can resist these and why should they??? There are so many choices for eating by the market from haute cuisine to vegetarian, to steaks and more. We chose to visit the famous Mr. Shakshooka, knows for its variations of this popular dish. Traditionally, Shakshooka is a rustic North African meal of eggs simmered in a flavorful tomato sauce. Mr. Shakshooka has variations with peppers, beef, Moroccan lamb sausage, eggplant and more. We opened with a chilly draft beer and the (almost) mandatory Hummus. It arrived with an enormous piece of traditional Israeli pan Challah, like the one from my childhood. Yum! This is what I got: Shakshooka with Merguez – a spicy Moroccan lamb sausage. I have to admit that I was a satisfied member of the “clean plate club” that day! Carrying our loot, full of good food and content with our day, we walked out of the market as shops started to close down for Shabbat and the Muezzin from the mosque was calling his prayer. What a great way to spend the day!